They are very bright and the base shape gives a far better/stable fitment than the circuit board type base. Thanks mate, Is the 2 rear lamps - one on top of each rear seat near the handle use the same type T10 as well? If those are LED anyway is there any need to upgrade them, or are they not bright enough? They are yellow - I dislike yellow light, it put me to sleep. Ah yes, I guess they had to colour match them to the front map lights. I notice that the manual says to have the Hyundai dealer replace them so it may not be an easy task. i tried following the manual to remove the light cover, yet too afraid I will break something if using force. Could not pry it following the manual instruction. I did manage to have some success from the door side as drawn with red arrow. Yet it still wouldn't come off. Any tips on how to remove this thing without breaking it? I think I'll wait until the lamps I ordered from ebay turn up before I tackle it though. Where did you ordered from? I bought mine from that link CraigB mentioned previously and mine came through a couple of days ago. I ordered the ones mentioned in posting #25 (cazlar) in this thread. I probably would have got the ones that CraigB posted instead had I noticed in time but my order was already in process by then. I'm sure anything will be an improvement on the dull incandescents in there at the moment. Now need to order the festoon size for the vanity shade light. Any recommendation? Put the LED in the driver side, beautiful light up white - Did the same on passenger side, all dark - What the hell. Checked everything still dark. Dammit blown a fuse Grab a replacement spare from the engine fuse box and got everything going again. All lights are white now. The last two @ the rear next to the roof handle I have no idea what to do with them. Cant seem to find a way to remove the cover. 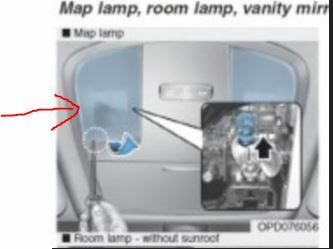 You might be able to suss out the rear two by removing the handles then pull the rubber door seal back far enough which should allow access into the headlining and you can drop the whole light fixture. Word from Tim the master Hyundai tech on one of the facebook groups (he doesn't come here anymore) is that he thinks they may be permanent yellow LEDs..
Dazzler - are you still in contact with Tim on FB? can you ask him if he knows of replacement unit to make it white? Does Hyundai have such a thing? He has an SR as well which his wife drives. He isn't sure at this stage. I just noticed he made a comment that he was pretty sure they were yellow wired in LED's. If I see or hear any more about those lights I will let you know. 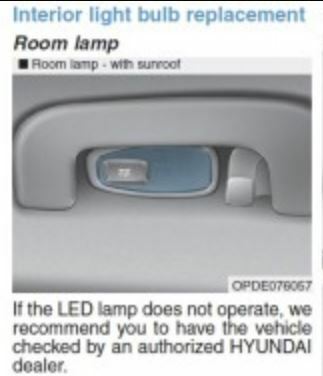 Thanks for all the info in this topic, I've been reading the forum for a few weeks since I bought my i30 ... now I have the leds everywhere except back seats and reverse lights. As for the back seats, is there any news? I don't quite like how it looks with both white/yellow... I'm even considering going back full yellow . I've tried to remove the little plastic without success. I would change the led if I can ever remove it. I'm good with the electrical part but not so much removing plastic without breaking anything! Has anyone also upgraded the reverse lights? is it worth the trouble? Have updated mine to some W16W LED that are 2000Lm LED Reverse Light , but have been thinking about trying these 4000LM Backup Reverse Light Bulbs 6000K white LED lamp Would be interested to hear if anyone has tried them yet. I use it for few months now and I'm very satified, visibility on my reverse camera at night is highly improved. Reasonable price a little less bright (500Lm per bulb) than the others suggested though as it's using three to four year old LED tech. I think I'll order the ones CraigB has at the moment, not keen on spending more than 15 bucks on this as I don't reverse that much at night.